Employers should also provide employees with the proper personal protective equipment (PPE), as well as well-maintained vehicles and other equipment, such as snow blowers, ladders, and personal fall protection systems when working at heights. Rooftop snow removal ranks at or near the top of all winter occupational hazards. Every year, workers are killed or seriously injured while performing snow or ice removal from rooftops and other building structures, such as decks. There is no specific OSHA standard for snow removal from roofs, but there are standards for fall protection systems, ladders, and aerial lifts that are commonly used when workers remove snow from roofs (see OSHA’s Hazard Alert on rooftop snow removal). Whether or not a federal or state standard covers a specific winter weather hazard, employers should always bear in mind that the Occupational Safety and Health (OSH) Act’s General Duty Clause states that employers have a legal duty to protect workers from recognized serious hazards in the workplace; such hazards include cold weather, snow, ice, wind, and any other occupational hazardous condition unique to winter weather. Most hazards and protective measures for winter work are not especially technical, and both employers and employees should be familiar with them if they are accustomed to working in winter weather. However, employers should never assume that their employees will implement protective measures they are aware of. Many OSHA standards require that employees be trained in the safety issues addressed in the standards. Proper training for winter weather will help protect employees from injuries and reduce an employer’s liability should an incident occur. Winter weather training is particularly important for employees who have arrived from a climate where winters are not severe (e.g., where there is no snow or ice accumulation); these employees should receive training in the basics of hazards and protection and specialized training for specific tasks, such as driving in winter weather, snow removal, and working at elevation. The following hazards/precautions are selected from OSHA’s Winter Weather site. Employers should ensure that properly trained workers inspect the vehicle systems to determine if they will work properly in snow and ice conditions. At a minimum, the following systems should be checked: brakes, cooling system, electrical system, engine systems, exhaust system, tires, oil, and visibility systems (exterior lights, defrosters, and wipers—winter windshield wipers should be installed). Drivers may skid or lose control of their vehicles more easily when driving on snow- and/or ice-covered roads. Work zones should be set up with traffic controls identified by signs, cones, barrels, and barriers. Workers should be trained on what to do if stranded in a vehicle. For example, workers should know how to operate the interior heating system without risk of carbon monoxide poisoning. 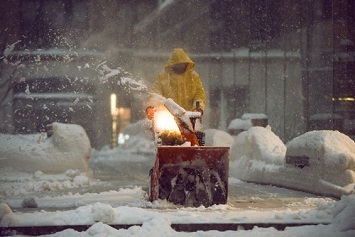 Jammed snow blowers are common, as are lacerations, broken bones, and amputations that result when operators attempt to clear a jam with their hands. The snow blower should be turned off. Once all movement ceases, the worker should use a long stick to clear wet snow or debris from the machine. Clearing snow from rooftops is a high-hazard activity that is often performed under extreme weather conditions (e.g., cold, high winds, or icy surfaces) by maintenance workers who do not have experience in the task. The safest approach is to employ a snow removal method that does not put workers on the roof. For example, workers can use ladders to apply de-icing materials or use snow rakes or drag lines from the ground. Using rakes or shovels from ladders is not advisable because workers can lose their balance. Removing downed trees/tree limbs is another common winter activity. This work is hazardous in any weather, but with slippery surfaces and the added weight of limbs coated with snow and ice, the work becomes extremely hazardous. Employees should ensure that only workers with extensive and specific training undertake the task. PPE (gloves, chaps, foot protection, eye protection, fall protection, hearing protection, and head protection) is essential. Also, only powered equipment designed for outdoor and wet conditions should be used.